Enter the bridge’s north tower and you’re stepping into history. 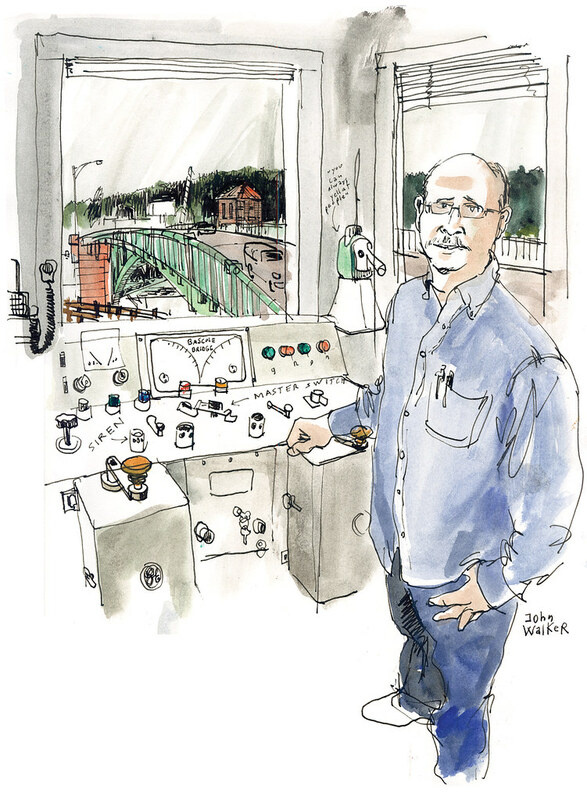 For 13 years, John Walker has been at the same controls his predecessors have used to operate the bridge since 1931. “The control panel will probably go to a museum,” he said as I tried to find a spot in the tiny room to sketch him. On Wednesday, he will press the siren, turn the master switch and pull the levers that open the draw spans for the last time. This bridge’s life will end and so will his job. Walker said he’ll miss long nights watching the barges go by and clear days with a picture-perfect view of Mount Rainier. He’s hopeful to find a new job through King County’s outplacement program. According to an independent engineering study released by King County in May, the 1931 bridge can’t be operated safely any longer. More than 1.5 million pounds of steel in each of its draw spans are too heavy for the crumbling pillars standing on the river banks — on a scale from 1 to 100, the bridge score is 4. I can see John Walker’s tower from the marina south of the bridge. From here, the bridge looks just like any other one. 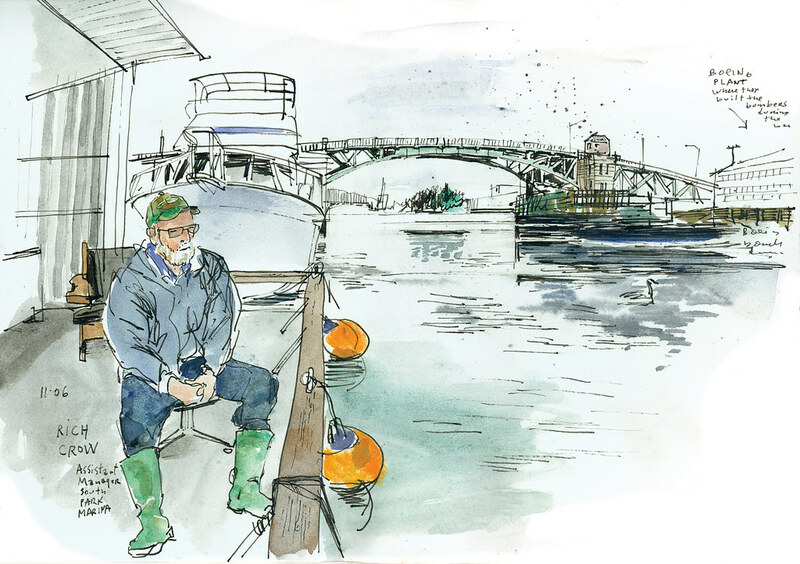 Its enormous steel draw spans arch gracefully over the Duwamish River as I sit to talk and sketch Rich Crow, owner of the 160-boat marina. Crow said it will be hard for customers coming from the north to get there after the bridge closes. He and his brother, Guy, have operated the marina since the mid 1970s.